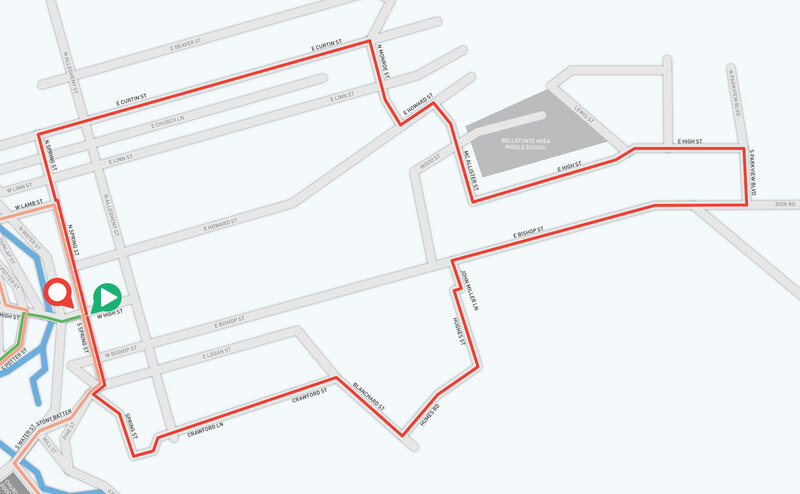 For the 10 Mile race route, you will first follow the 4 Mile race route. When they turn left onto W High St. to finish you will instead continue straight on Spring St and follow these directions. Follow Spring St. to Pine St. Turn RIGHT onto Pine St. Follow Valentine Hill to the turn-around. Grab some water or a freeze-pop. Turn-around. Turn RIGHT onto Barrington Lane. Follow Amberleigh to the Benner Pike (i.e. SR 150). CROSS THE BENNER PIKE AT THE LIGHT. YOU’LL SEE A POLICE OFFICER STOPPING TRAFFIC. CROSS HERE AND ONLY HERE. Turn RIGHT onto SR150/the Benner Pike, running toward traffic. Cross SR 550 to continue STRAIGHT to Roopsburg/Slaughterhouse Rd. Follow Roopsburg Rd. to S. Potter St.
Bear RIGHT onto S. Potter St. Follow S. Potter St. to High St. Turn RIGHT onto High St. and finish in front of the Railroad Station at Talleyrand Park! Watch for traffic near to the finish!